Caribou are an iconic wildlife species of the Canada’s boreal forests and northern tundra. They play important roles in healthy ecosystems and also are critical to many indigenous people as a source of food and culture through subsistence hunting. But caribou herds across the country are in decline, some of them perilously so. Boreal caribou populations across the country are listed as threatened on the Species At Risk Act (SARA) and the Southern and Central Mountain populations of BC and Alberta were assessed as Endangered by the Committee on the Status of Endangered Wildlife in Canada (COSEWIC). Many of the barren ground caribou herds are below historical levels and the Peary caribou of the far north are listed as Endangered. The cause of the declines are a complex mix of industrial development, increased predator access, and habitat loss. Caribou health is a major factor in recovery of the herds. Infectious diseases and other determinants of health play a critical roles in caribou population status through direct and indirect effects on survival and reproduction. Dr. Susan Kutz and her team at the University of Calgary‘s Alberta Region of the CWHC are cooperating with governments, researchers and stakeholders in BC, Alberta, the NWT and elsewhere to monitor the health of boreal and barren ground caribou. 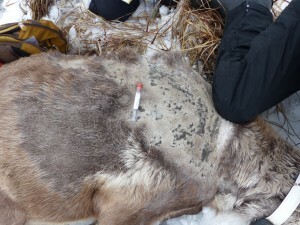 Taking samples & documenting winter tick infestation on an adult female boreal caribou. Photo courtesy of Brad and Diane Culling. The Boreal Caribou Health Research Program led by Bryan Macbeth is a collaboration with the BC Government that is evaluating caribou in northern British Columbia and Alberta for exposure to, or infection with, selected bacterial, viral, and parasitic diseases, and other indices of health related to chronic physiological stress, immunity, nutrition, and toxicology. Preliminary results have identified potential threats to caribou health and fitness including probable nutrient deficiencies, infection with the protozoan parasite Neospora caninum, and significant hair loss related to infestation with winter ticks (Dermacentor albipictus). The project also identified the presence of the bacterial pathogen Erysipelothrix rhusiopathiae, previously unknown in free-ranging caribou. In the Sahtu region of the NWT, a community-based monitoring program aims to establish health indices for caribou. This work is supported by the Government of the NWT, the Sahtu Renewable Resources Board and the NWT Cumulative Impacts Monitoring Program (NWT CIMP). 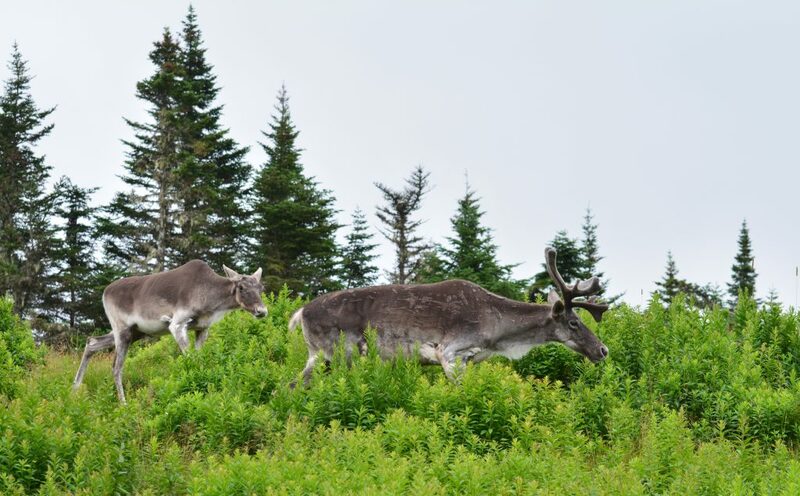 The project has provided new information on the body condition and disease status of subsistence harvested animals and directly contributes to a more holistic understanding of caribou herd health. Dr. Kutz and her team have documented what is present for pathogen biodiversity and abundance (measured by prevalence and intensity) and provided a baseline for detecting changes (new and emerging pathogens) in the future. In addition to screening for pathogens important for caribou, they have also screened for pathogens important for human health to ensure that community members can be confident that their meat is safe to eat. This project collected data using standardized methods developed by the CircumArctic Rangifer Monitoring Assessment Network (CARMA). By using standardized collection methods, data collected from different communities and herds can be combined and integrated in order to scale up to a herd-level understanding. The CWHC will continue to collaborate with partners to provide a novel picture of caribou health in Canada, and strive to link a better of understanding of the determinants of caribou health to conservation initiatives. Previous story Why was 2015 a tough year for BC’s young black bears?